ISO 14000 is similar to ISO 9000 quality management in that both pertain to the process of how a product is produced, rather than to the product itself. As with ISO 9001, certification is performed by third-party organizations rather than being awarded by ISO directly. The ISO 19011 and ISO 17021 audit standards apply when audits are being performed. The requirements of ISO 14001 are an integral part of the European Union's Eco-Management and Audit Scheme (EMAS). EMAS's structure and material are more demanding, mainly concerning performance improvement, legal compliance, and reporting duties. The current version of ISO 14001 is ISO 14001:2015, which was published in September 2015. In March 1992, BSI Group published the world's first environmental management systems standard, BS 7750, as part of a response to growing concerns about protecting the environment. Prior to this, environmental management had been part of larger systems such as Responsible Care. BS 7750 supplied the template for the development of the ISO 14000 series in 1996, which has representation from ISO committees all over the world. As of 2017[update], more than 300,000 certifications to ISO 14001 can be found in 171 countries. The ISO 14000 family includes most notably the ISO 14001 standard, which represents the core set of standards used by organizations for designing and implementing an effective environmental management system (EMS). Other standards in this series include ISO 14004, which gives additional guidelines for a good EMS, and more specialized standards dealing with specific aspects of environmental management. The major objective of the ISO 14000 series of norms is to provide "practical tools for companies and organizations of all kinds looking to manage their environmental responsibilities." ISO 14001 was developed primarily to assist companies with a framework for better management control, which can result in reducing their environmental impacts. In addition to improvements in performance, organizations can reap a number of economic benefits, including higher conformance with legislative and regulatory requirements by adopting the ISO standard. By minimizing the risk of regulatory and environmental liability fines and improving an organization’s efficiency, benefits can include a reduction in waste, consumption of resources, and operating costs. Secondly, as an internationally recognized standard, businesses operating in multiple locations across the globe can leverage their conformance to ISO 14001, eliminating the need for multiple registrations or certifications. Thirdly, there has been a push in the last decade by consumers for companies to adopt better internal controls, making the incorporation of ISO 14001 a smart approach for the long-term viability of businesses. This can provide them with a competitive advantage against companies that do not adopt the standard (Potoki & Prakash, 2005). This in turn can have a positive impact on a company's asset value (Van der Deldt, 1997). It can lead to improved public perceptions of the business, placing them in a better position to operate in the international marketplace. The use of ISO 14001 can demonstrate an innovative and forward-thinking approach to customers and prospective employees. It can increase a business’s access to new customers and business partners. In some markets it can potentially reduce public liability insurance costs. It can also serve to reduce trade barriers between registered businesses. There is growing interest in including certification to ISO 14001 in tenders for public-private partnerships for infrastructure renewal. Evidence of value in terms of environmental quality and benefit to the taxpayer has been shown in highway projects in Canada. There are many reasons that ISO 14001 should be potentially attractive to supply chain managers, including the use of the voluntary standard to guide the development of integrated systems, its requirement for supply chain members in industries such as automotive and aerospace, the potential of pollution prevention leading to reduced costs of production and higher profits, its alignment with the growing importance of corporate social responsibility, and the possibility that an ISO-registered system may provide firms with a unique environmental resource, capabilities, and benefits that lead to competitive advantage. Research on the supply chain impact of ISO 14001 registration posited that potential positive impacts might include more proactive environmental management, higher levels of communication, higher levels of waste reduction and cost efficiency, better ROI, higher levels of customer relationship management, fewer issues with employee health, and a reduced number of safety incidents. This research concluded that ISO 14001 registration can be leveraged across the supply chain for competitive advantage. ^ "ISO 14000 family - Environmental management". www.iso.org. ISO. Retrieved 10 October 2018. ^ a b "From ISO 14001 to EMAS: Mind the gap" (PDF). Office of the German EMAS Advisory Board. August 2014. Retrieved 29 November 2017. ^ Naden, C. (15 September 2015). "The newly revised ISO 14001 is here". International Organization for Standardization. Retrieved 29 November 2017. ^ a b c "ISO 14000 family - Environmental management". International Organization for Standardization. Retrieved 22 May 2017. ^ a b National Research Council (1999). Environmental Management Systems and ISO 14001 Federal Facilities Council Report No. 138. National Academies Press. doi:10.17226/6481. ISBN 9780309184342. ^ a b "ISO 14001". International Institute for Sustainable Development. 2013. Retrieved 29 November 2017. ^ "ISO 14001 Environmental Management Systems - Revision". International Organization for Standardization. Retrieved 29 November 2017. ^ a b c d e f g h Martin, R. (10 March 1998). "ISO 14001 Guidance Manual" (PDF). National Center for Environmental Decision-Making Research. Archived from the original (PDF) on 28 July 2011. Retrieved 29 November 2017. 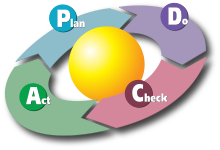 ^ Hutchens Jr., S. "Using ISO 9001 or ISO 14001 to Gain a Competitive Advantage". Intertek. Retrieved 29 November 2017. ^ "Statistics & graphs". European Commission. April 2017. Retrieved 29 November 2017.